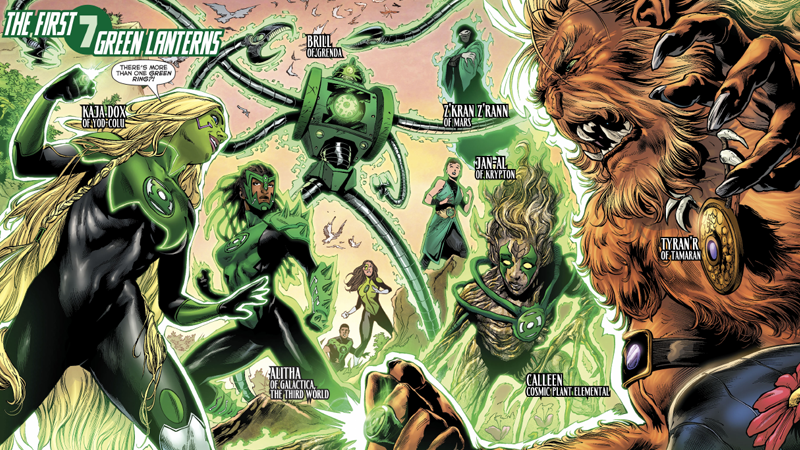 Sam Humphries, Eduardo Pansica, and Julio Ferreira’s Green Lanterns comic has been doing some of the weirdest stuff in DC Rebirth, using its cosmic scope to explore the vast history of the Lantern corps. Its latest issue tackles the coming together of the first Green Lanterns... but it turns out that they weren’t quite as heroic as you might have expected. Jessica Cruz and Simon Baz’s recent adventures have seen them flung back billions of years into the past, being hunted by Volthoom, the first Lantern, driven insane by the overwhelming emotions unleased by his ring. Fleeing to a small planet in the Sol system to avoid Volthoom’s detection, the two find themselves witnessing a historic moment in this week’s Green Lanterns #28: the gathering of the first ever Green Lanterns. Seven beings from planets all across the DC cosmos are tasked by Cruz and Baz’s mentor Rami—a weirder member of the Guardians of the Universe—with defeating Volthoom before he destroys the galaxy. There’s a slight problem with Rami’s plans, however... the first lanterns chosen by his green power rings are not exactly keen on the whole “teamwork” thing. Fights break out almost immediately, despite Jessica’s attempts to rally the gathered ring-bearers—some want to use the rings for ulterior motives back on their homeworlds. Some, like Calleen and Kaja, simply don’t care about the supposed threat Rami has brought them together to defeat. And then, there’s folks like Tyran’r, who just decide they’re going to beat up the rest of the gathered Lanterns and steal their rings for himself. Surprisingly, the most messed up of all is Jan-Al, the Kryptonian captain of the planet’s inaugural colonization ship. She’s chosen for her complete faith in the Krypton deity Rao. That belief acted as an embodiment of willpower when her mission went horribly wrong, stranding her and her crew on an unknown planet. You’d think the first ever canonical Kryptonian Lantern in DC Comics history—outside of a few Elseworlds tales where Superman himself became the Lantern of his homeworld’s space sector, that is—would be more heroic. But Jan-Al, like Tyran’r, decides that she must heed the will of Rao himself and take the rings for herself, so she can grant them to her stranded crew. Jan-Al ends up supercharging her ring to blast her ‘fellow’ Lanterns about though, and things go wrong pretty quickly. The earliest Lantern rings don’t have the same safety features that Jessica or Simon’s rings do, leaving poor Jan-Al to get overwhelmed by the power of her will, and... well, go boom. Even in their earliest days, the Green Lanterns were pretty good at getting themselves killed, it seems. Jan-Al’s death at least has one positive outcome: so shocked by the power she could unleash, her fellow first Lanterns finally decided to listen to Jessica, and being training to work together and defeat Volthoom. All it took was one jerk-y Kryptonian going kablammo, and thus the Green Lantern Corps was born.